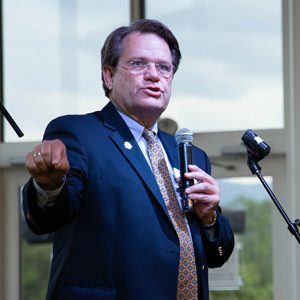 TIGERVILLE, SC (courtesy ngu.edu) — It’s official: Dr. Gene C. Fant, Jr., has wrapped up his first year as president at North Greenville University! Wondering what NGU’s been up to since he arrived? Here are the highlights. 125th Anniversary Celebration and Presidential Inauguration – Fant took office on June 1, 2017, just as the 125th Anniversary Celebration at NGU was beginning, which included a slew of special events that culminated in his official inauguration on April 13, 2018. Among the nearly 1,000 attendees at the inauguration were Fant’s relatives and friends, NGU family, and delegates from more than 22 fellow universities. Unit G Renovation – Last fall, NGU’s Campus Enhancements team did a total remodel of Unit G, a residence hall for male students that now boasts new electrical, heating and air, flooring, LED lighting, roofing, furniture, and more. NGU hopes this will be the first of many residence hall remodels as funding becomes available. Dillard Field – Ashmore Park is underway, a project that will add a new 700-seat athletic stadium, residential options, and recreational spaces to NGU’s Tigerville campus. Phase one included a complete reworking of the newly named Dillard Field, where NGU hosted its first National Collegiate Athletic Association (NCAA) Division II regional baseball tournament in May. Martin Timothy Brashier Graduate Scholars Program – Made possible by a gift from the T. Walter Brashier family, Fant has introduced the Martin Timothy Brashier Graduate Scholars Program to provide scholarships to residents of Upstate South Carolina and NGU alumni who are enrolled in one of NGU’s online undergraduate or graduate programs. Mary Black School of Nursing Partnership – Through a new partnership with the Mary Black School of Nursing at the University of South Carolina Upstate, NGU biology majors can now earn a dual degree in nursing within just five years. NGU’s new biology and nursing degree is intended to meet the growing demand for nurses in the state. Campus Safety – Fant has also worked to improve campus safety at NGU by adding additional lighting throughout campus, better vehicles and training for Campus Security officers, and new safety measures such as Nightlock devices for faculty and staff to use during emergency situations. Red Carpet Gala – The NGU family gathered last October at the Poinsett Club in downtown Greenville, SC, for a Red Carpet Gala to celebrate the community that has nurtured the institution for the past several decades. At the event, the university recognized donors who have shown exemplary service, commitment, and a lifetime of giving to NGU. Chick-fil-A Restaurant – Under Fant’s leadership, NGU has opened a brand new Chick-fil-A at its Tigerville campus. The restaurant officially opened on Aug. 15, 2018 — just in time for the start of the 2018-19 academic year.